Super sports was a dream since childhood. When I first saw the Repsol Edition Fireblade back it 2007 while walking in the street of Brighton le Sands, it took me back to the highlights of Nicky Hayden racing. Though I wanted the CBR600RR , the main reason being it’s underseat exhaust. I ended up getting a Yamaha R6. Great bike but wasn’t satisfied for some unknown reason. 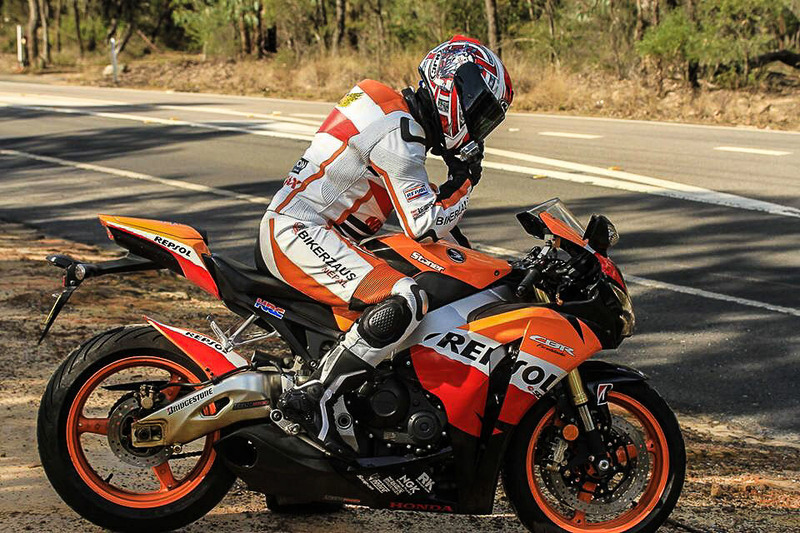 The wait wasn’t over until the HONDA CBR 1000 RR FIREBLADE CASEY STONER LIMITED EDITION (170 ever made) was on the driveway straight up from Queensland. The delivery dude said , “ mate 178PS isn’t enough huh!!!! that you need a Taylor Made in it.” And I was just thinking within myself , a revolver is not automatically a killer , a dynamite is not automatically a destruction and 178PS is not automatically a devastation. Seriously Fireblade looks gorgeous. Yes the Italians are so seductive, and all the electronics in them are like a magnet but still I am not ashamed to say that I love the fireblades so much. And the Repsol colour scheme and I have a amazing chemistry. We could go along for 300kms without a break. Getting lost within the National Parks ( New South Wales) did became a weekend job. The Honda’s has a clever way of delivering the principle of mass centralisation by locating the components of the motorcycle so that the heaviest ones are placed as close to the centre of the gravity as possible. It has a leaned forward riding position, the mirror shows the stuffs behind and the foot pegs aren’t high up for a comfortable riding. The build quality and well finished look makes it even more practical bike. The liquid cooled DOHC, 999cc fuel injected inline four used the titanium intake valves with the lighter springs to shave away the weight. The slipper clutched are joy. I was surprised when I didn’t see the steering damper. Then later figured out that now it is a bit shy to be out and resides under the tank cover. When revving it over the bumpy parts of Grand Pacific Drive, it’d never complain. The electronic steering damper works like God staying invisible. Fireblade is quite different, while cruising normally it is quite happy to move heavily even in low engine speed. And we could just push the throttle without downshifting. Thats how I smoked my mate once. Even on low 2500 rpm on top gear , smooth overtakes would just cost a wrist action. It would happily cruise on 150km/hr without scaring the hell out. The performance was like a lovely madness. 100km/hr would just take few seconds and after few more the numbers would just go with a quick flow. 197km/hr didn’t charge me a lot of time. The ride quality is fantastic. While I felt safe from the unwanted tickets, high speed and around the corners it’d show off it’s stability, accuracy, agility and the confidence. The Blade is amazingly wonderful machine. It hardly scared me but gently let me feel the serious power inside it. it wouldn’t mind a pushed out ride. All the goodies in it and the way it expresses itself proves to be a very civilised , most well behaved most reliable litre class sports bike that I’ve ridden so far. Life has some dark sides too. A dark night became a nightmare for me leaving remainder of 169 units of HONDA CBR 1000RR CASEY STONER LIMITED EDTION FIREBLADE. I am comforted by the feeling that it might have found a home among the statutorily written-off track bike. It is always missed dearly. HARLEY DAVIDSON SPORTSTER 48 WITH BIKERZAUS NEPAL (PART II) RIDERS NIGHT!